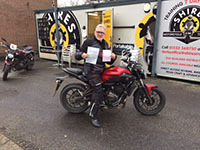 Had a great day doing my CBT a week ago with Colin at West Bridgford. 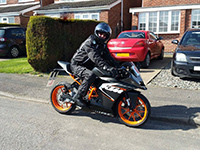 I was returning to biking after 40 years! Colin put me at ease and it didn't take long for it to come back to me and for the wobbles to go away. As Colin said, "it's like riding a bike"! I wouldn't hesitate to recommend Shires. They are very friendly and very professional. I look forward to using Shires again in future when eventually I'll go for my full test. 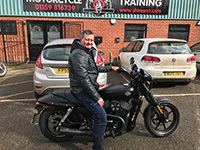 After a bad experience with another company i came to shires and was made to feel welcome, with the instructors being very patient and professional. I am happy to say they got me through both mod 1 and 2. Thank you shires ! 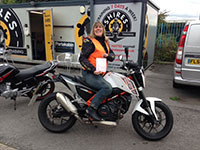 I have thoroughly enjoyed learning to ride with Shires.A great Team,I would urge anyone wishing to learn to ride a bike to only use Shires!!!! The best in the business A special thanks to Colin,Emily and Woody for their support,lovely people!!!!! Thank you Guys!!!!!! 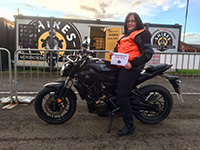 Initially went to another Motorcycle School having never ridden a bike before. All they wanted to do was take my money and waste my time! Avoid them at all costs !! I then went to Shires in Derby ! Wow what a difference! Wonderful people! 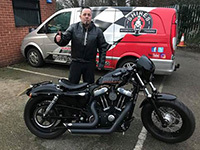 Lovely new Bikes and clothing! Excellent value for money. 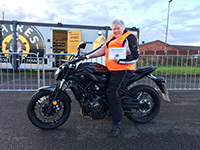 I have taken my CBT, my CBT Plus, Mod 1 and just passed my Mod 2 with them. I have had a fabulous time . They are all great people and offer a really friendly service. Thank you all so much. All I got from Shires was help and support. The Bikes are spot on, The kit is spot on. The facilities are spot on. All the instructors are spot on. The Admin girls are spot on. This is a Top School. 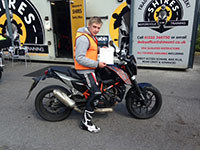 If you are serious about doing your Mod 1 & 2 give these guys a ring, you won�t find better. Shires get a 10/10 from me. The Shires team in Derby are absolutely first class in every way. 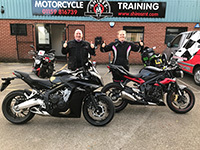 Whether it is Emily in the office with her enthusiasm and cheerful confidence boosting soothing words or the range of hugely experienced and patient instructors; Colin, Mark and John who took me from complete novice to passing my Mod II in little over 4 weeks was nothing short of amazing. These guys are a class act and I can't recommend them highly enough. Cannot recommend shires enough!! From staff all the way down to the kit they provide. Kit is top notch, bikes are well maintained and most of them new. And the staff are on a different level, making you feel at ease and always making the training environment fun. 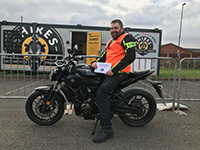 My father and I both passed our full motorbike licence within a month. 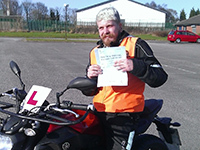 All the way from cbt up to Mod 2. Great company. Best in town!! Site design & code by Barry Walters.